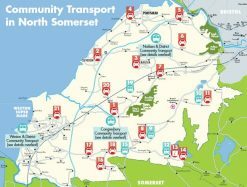 If you need advice or to get to an appointment but have difficulty with mobility, there are a number of Community Transport schemes in North Somerset. Community transport groups which provide fully accessible minibuses for a wide range of regular shopping trips, dial-a-ride, group hire and day trips. Car schemes which provide services for a range of local trips, particularly helping people to attend medical appointments.